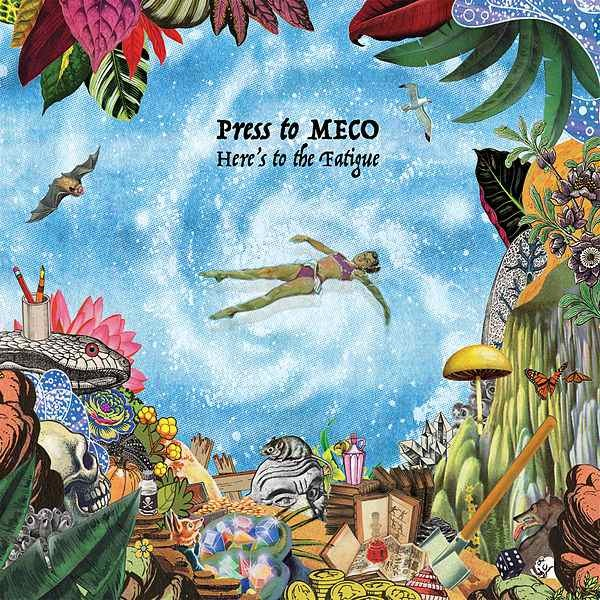 The fact that Press To MECO have been given the chance to release a second album at all is borderline miraculous. As solid of a widespread introduction as 2015’s Good Intent was, it felt as though that album never really picked up the steam it deserved, flying far under the radar for far too many. So it makes sense that the trio’s vaunted second chance comes now, when rock has made such a considerable effort to embrace more left-of-centre ideas, and has largely removed the safety net that was so stifling three years ago. And for a band like Press To MECO, fusing daring progressive rock with three-part vocal harmonies and the most steadfast of pop hooks, that’s only a good thing. What’s even better, though, is how Here’s To The Fatigue has gone the extra mile in solidifying both sides of Press To MECO’s repertoire to an even greater degree. To call it evolution might be a bit much, but the progression couldn’t be more noticeable; this is a leaner, more potent album as a whole, refusing to skimp on their spiky, off-kilter instrumentation, but doubling down on the glorious excess of their melodies and vocals, ideal for an album that ultimately centres around pushing through life’s hardships and simply being thankful for sticking around. It’s noticeable almost immediately too; first track proper Familiar Ground shows just how effectively its crunching guitars and pounding, detailed drumwork can be when paired with a vocal ensemble that’s so inimitably joyous that it borders on transcendent. As established groundwork, it’s remarkably consistent, able to translate that exuberance all across the album whenever they need it, like on the unashamed pop-rock gem that is If All Your Parts Don’t Make A Whole, or the tense chugging of Itchy Fingers that turns those foundations on their head and still comes out with a compelling, catchy end result. As far as song construction goes, Here’s To The Fatigue is pretty much bulletproof, rarely stooping to anything below pretty good at the very least. Even A Place In It All, for being the mostly understated, solemn alt-rock ballad that is is, still rolls up some momentum for it’s arena-ready explosion near its conclusion. It’s this knowledge and adroitness with dynamics that proves to be Press To MECO’s key strength, in that their roots remain in a very familiar alt-rock formula, but they’re branching out further than so many bands would even dare to go, and with a razor-sharp production job that makes this sound explode without compromising some genuine heft that can come in the guitars, this is simple but effective in the best possible way. With the necessary push, the likes of the title track or The Things That We Don’t Talk About could be genuine alt-rock staples; they really have that power and curiosity factor that proves that even rock at its most mainstream level can still be thrilling. And the fact that Press To MECO are even in the conversation of mainstream rock is just incredible in itself, yet more proof if it was needed that homegrown rock is hurtling down the best path possible. It’s bands like this that will be leading the charge too, subverting what is expected of an alt-rock or Britrock album and turning it into something fresh and exciting. Here’s To The Fatigue is just that, the sort of accessible yet layered and challenging album that, by all rights, should be the catalyst for Press To MECO to truly explode into a household name. Only time will tell whether that actually happens, but it’s the only just outcome for an album like this. ‘Here’s To The Fatigue’ by Press To MECO is released on 30th March on Marshall Records.